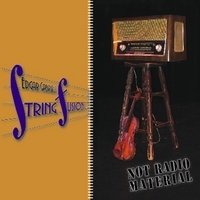 Edgar Gabriel's StringFusion is an exciting new jazz fusion ensemble from Chicago. With former Cirque du Soleil electric violinist Edgar Gabriel at the helm, this group fuses elements of rock, classical and world music into its intelligent entertaining character. “Not Radio Material” is collection of 11 original tunes that exemplify the creative and technical scope of these expert musicians. Track 1: “Fat Chance on a Friday Afternoon” music by Stone ©1987. In the late 1980’s Edgar and high school friend Stone had a band called “Fat Jam Sangwich” where Stone wrote this tune about his fat cat Chance. This funk tune sat dormant in Edgar’s file cabinet for 20 years. Longtime friend of Stone, recording engineer and bassist Maurice Houston produced this great tune. Track 2: “There is No Sun Today” music by Edgar Gabriel ©2006 (ASCAP). Edgar wrote this bossa-nova, after not seeing the sun for weeks during a long Chicago winter. Track 3: “Would You Be My Valentine” words and music by Edgar Gabriel ©2001 (ASCAP). Edgar wrote this R & B song as a Valentine’s Day present for his wife Melissa. Vocalist Mauree’ lends her wonderful voice to this Valentine. Track 4: “Mobile” music by Edgar Gabriel ©2007 (ASCAP). This world dance mix evolved from Edgar’s daughter Annabel as she became mobile and learned to crawl. Track 5: “I Knew That” music by Kevin O’Connell ©2007 (BMI). Keyboardist Kevin O’Connell wrote this great jazz tune reminiscent of post bop Thelonius Monk. Track 6: “Blue 7” music by Kevin O’Connell ©1994 (BMI) a great slow blues by Kevin. Track 7: “Nose Bleed” music by Edgar Gabriel ©2007 (ASCAP). An acid rock blues by the power trio of Edgar- violin, Maurice Houston- Bass and Dave Rush-Drums. Track 8: “Train Blues” music by Edgar Gabriel ©2007 (ASCAP). Inspired and introduced by Annabel Gabriel, this is the Orange Blossom Special meets Texas Blues. Edgar sings this one, the only other non-instrumental on the Cd. Track 9: “Farewell to a Friend” music by Edgar Gabriel ©1998 (ASCAP). Edgar originally recorded this jazz waltz with pianist Greg Lawrence for their “Gabriel-Lawerence Inventions” Cd. The original recording is dedicated to bassist Andy Bastounes. Unfortunately, Edgar now has too many people to dedicate this version to. Greg Lawrence’s life was tragically cut short in 2000. Track 10: “Renaissance Man” music by Edgar Gabriel ©2007 (ASCAP). This gypsy jazz tune was written for Edgar’s good friend, jazz violinist Johnny Frigo the true Renaissance Man. Johnny passed away on July 4th 2007 at the age of 90. Track 11: “Happy World Mix” music by Edgar Gabriel ©2007 (ASCAP). This funk tune incorporates world rhythms and tonalities for a new “happy” world sound. Tracks 2,5,9, and 10 recorded by Andrew Arbetter at Studio Media Evanston, IL. All songs mixed and mastered by Maurice Houston at Studio M, North Chicago, IL. StringFusion (Back Cover) Photo: by Jim Titschler, The Studio of Photography. All songs produced by Edgar Gabriel except Fat Chance On A Friday Afternoon produced by Maurice Houston. StringFusion ® is a registered service mark of Edgar Gabriel Inc.
Fusion groups of the past like Weather Report and Herbie Hancock's Headhunters band were never constricted by the limitations of musical genre and neither is Edgar Gabriel's Stringfusion. Not Radio Material has a little bit of something for anyone. Jazz, blues, rock. You name it and it's there. You won't find anything this good on the stale pop airwaves making this truly Not Radio Material. Enjoy.